Light rays bend when they travel from one medium to another; the amount of bending is determined by the refractive indices of the two media. If one medium has a particular curved shape, it functions as a lens. The cornea, humours, and crystalline lens of the eye together form a lens that focuses images on the retina. Our eyes are adapted for viewing in air. Water, however, has approximately the same refractive index as the cornea (both about 1.33), effectively eliminating the cornea's focusing properties. When our eyes are in water, instead of focusing images on the retina, they now focus them far behind the retina, resulting in an extremely blurred image from hypermetropia. Water has a significantly different refractive index to air, and this affects the focusing of the eye. Most animals' eyes are adapted to either underwater or air vision, and do not focus properly when in the other environment. The crystalline lenses of fishes' eyes are extremely convex, almost spherical, and their refractive indices are the highest of all the animals. These properties enable proper focusing of the light rays and in turn proper image formation on the retina. This convex lens gives the name to the fisheye lens in photography. By wearing a flat diving mask, humans can see clearly under water. The scuba mask's flat window separates the eyes from the surrounding water by a layer of air. Light rays entering from water into the flat parallel window change their direction minimally within the window material itself. But when these rays exit the window into the air space between the flat window and the eye, the refraction is quite noticeable. The view paths refract (bend) in a manner similar to viewing fish kept in an aquarium. Linear polarizing filters decrease visibility underwater by limiting ambient light and dimming artificial light sources. While wearing a flat scuba mask or goggles, objects underwater will appear 33% bigger (34% bigger in salt water) and 25% closer than they actually are. Also pincushion distortion and lateral chromatic aberration are noticeable. Double-dome masks restore natural sized underwater vision and field of view, with certain limitations. Diving masks can be fitted with lenses for divers needing optical correction to improve vision. corrective lenses are ground flat on one side and optically cemented to the inside face of the mask lens. This provides the same amount of correction above and below the surface of the water. Bifocal lenses are also available for this application. Water attenuates light due to absorption which varies as a function of frequency. In other words, as light passes through a greater distance of water color is selectively absorbed by the water. Color absorption is also affected by turbidity of the water and dissolved material. 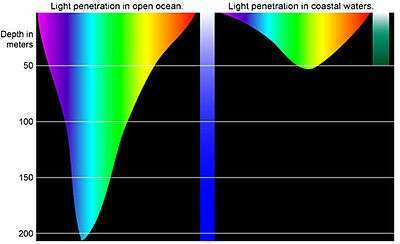 Water preferentially absorbs red light, and to a lesser extent, yellow, green and violet light, so the color that is least absorbed by water is blue light. Particulates and dissolved materials may absorb different frequencies, and this will affect the color at depth, with results such as the typically green color in many coastal waters, and the dark red-brown color of many fresh water rivers and lakes due to dissolved organic matter. a. Fluorescent yellow, orange, and red. b. Regular yellow, orange, and white. a. Fluorescent and regular yellow, orange, red and white. a. Fluorescent yellow-green and yellow-orange. b. Regular yellow and white. B. For moderately turbid water (sounds, bays, coastal water). a. Any fluorescent in the yellows, oranges, and reds. C. For clear water (southern water, deep water off shore, etc.). 1. With any type of illumination fluorescent paints are superior. a. With long viewing distances, fluorescent green and yellow-green. b. With short viewing distances, fluorescent orange is excellent. The most difficult colors at the limits of visibility with a water background are dark colors such as gray or black. A very near-sighted person (eyesight abnormality resulting from the eye's faulty refractive index due to which the distant objects appear blurred) can see more or less normally under water. Scuba divers with interest in underwater photography may notice presbyopic changes while diving before they recognize the symptoms in their normal routines due to the near focus in low light conditions. The Moken people of South-East Asia are able to focus underwater to pick up tiny shellfish and other food items. Gislén et al. have compared Moken and untrained European children and found that the underwater visual acuity of the Moken was twice that of their untrained European counterparts. European children after 1 month of training also showed the same level of underwater visual acuity. This is due to the contraction of the pupil, instead of the usual dilation (mydriasis) that is undergone when a normal, untrained eye, accustomed to viewing in air, is submerged. The standard measurement for underwater visibility is the distance at which a Secchi disc can be seen. The range of underwater vision is usually limited by turbidity. In very clear water visibility may extend as far as about 80m, and a record Secchi depth of 79 m has been reported from a coastal polynya of the Eastern Weddell Sea, Antarctica.In other sea waters, Secchi depths in the 50 to 70 m range have occasionally been recorded, including a 1985 record of 53 m in the Eastern and up to 62 m in the tropical Pacific Ocean. This level of visibility is seldom found in surface fresh water. Crater Lake, Oregon, is often cited for clarity, but the maximum recorded Secchi depth using a 2 m disc is 44 m. The Dry valley lakes of Antarctica and Silfra in Iceland have also been reported as exceptionally clear. Factors affecting visibility include: particles in the water (turbidity), salinity gradients (haloclines), temperature gradients (thermoclines) and dissolved organic matter. Low visibility is defined by NOAA for operational purposes as: "When visual contact with the dive buddy can no longer be maintained." 1 2 3 4 5 6 7 Adolfson, J.; Berghage, T. (1974). Perception and Performance Under Water. John Wiley & Sons. ISBN 0-471-00900-8. 1 2 Luria, SM; Kinney, J. A. (March 1970). "Underwater vision". Science. 167 (3924): 1454–61. doi:10.1126/science.167.3924.1454. PMID 5415277. Retrieved 2008-07-06. ↑ Weltman, G.; Christianson, R. A.; Egstrom, G. H. (October 1965). "Visual fields of the scuba diver". Human Factors. 7 (5): 423–30. PMID 5882204. ↑ Luria, S. M.; Kinney, J. A. (December 1974). "Linear polarizing filters and underwater vision". Undersea Biomedical Research. 1 (4): 371–8. PMID 4469103. Retrieved 2008-07-06. ↑ Hegde, M. (30 September 2009). "The Blue, the Bluer, and the Bluest Ocean". NASA Goddard Earth Sciences Data and Information Services. Retrieved 27 May 2011. ↑ =Bennett, Q. M. (June 2008). "New thoughts on the correction of presbyopia for divers". Diving and Hyperbaric Medicine. 38 (2): 163–4. PMID 22692711. Retrieved 2013-04-19. ↑ Gislén A, Dacke M, Kröger RH, Abrahamsson M, Nilsson DE, Warrant EJ (May 2003). "Superior underwater vision in a human population of sea gypsies". Curr. Biol. 13 (10): 833–6. doi:10.1016/S0960-9822(03)00290-2. PMID 12747831. Retrieved 2008-07-06. ↑ Gislén A, Warrant EJ, Dacke M, Kröger RH (October 2006). "Visual training improves underwater vision in children". Vision Res. 46 (20): 3443–50. doi:10.1016/j.visres.2006.05.004. PMID 16806388. Retrieved 2008-07-06. ↑ Gibb, Natalie. "Factors That Affect Visibility Underwater When Diving". Scuba diving terminology. about.com. Retrieved 26 November 2016. ↑ Staff (9 July 2014). "Diving in low visibility" (PDF). Policy 0308. NOAA Office of Marine and Aviation Operations. p. 2. Retrieved 26 November 2016. Chou, B; Legerton, JA; Schwiegerling, J. "Improving Underwater Vision: Contact lenses and other options can help patients safely maximize their vision underwater". Contact Lens Spectrum (June 2007). Retrieved 2009-06-27.